DILKON, Navajo Nation -- Dine' Roberto Nutlouis has been on a journey of discovering how Peabody Coal abused the aquifer, and how to share this with the local communities. Along the way, the Dine' teachings have guided him as a farmer, and in the struggle for a just transition to solar from fossil fuels. Speaking at Dine' CARE's Western Peoples Convention, Roberto said, "We are Sacred Beings, we come from an intention of Power." Roberto said white corn symbolizes peace and is offered before the sun comes up in the morning. Blue corn gives a lot of strength, for work on the land, and it has a lot of antioxidants. The juniper ash is used in the blue corn meal. "That is the key to longevity and having strong healthy bones." Yellow corn is used for offerings in the evening time, and in Ceremonies. Roberto described how Navajo and Hopi young people came together and created the Black Mesa Water Coalition in 2001. 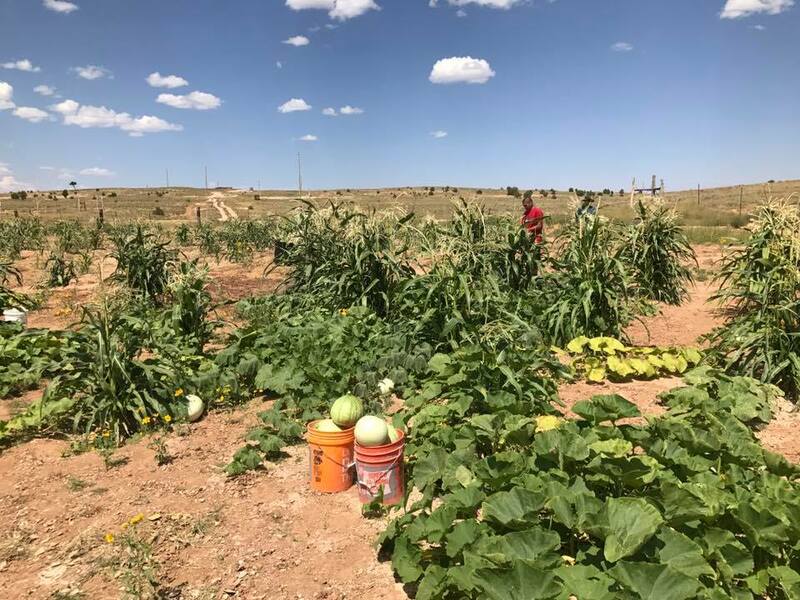 Navajo and Hopi youths came together to inject their voice as young people at the time, as they were learning about the abuse of their groundwater. "Peabody was pumping our pristine water, an outrageous amount." They tried to get the tribe to stand with the community. Finally, they were successful in 2005, and the use of pristine Aquifer water for the transport of coal was halted. 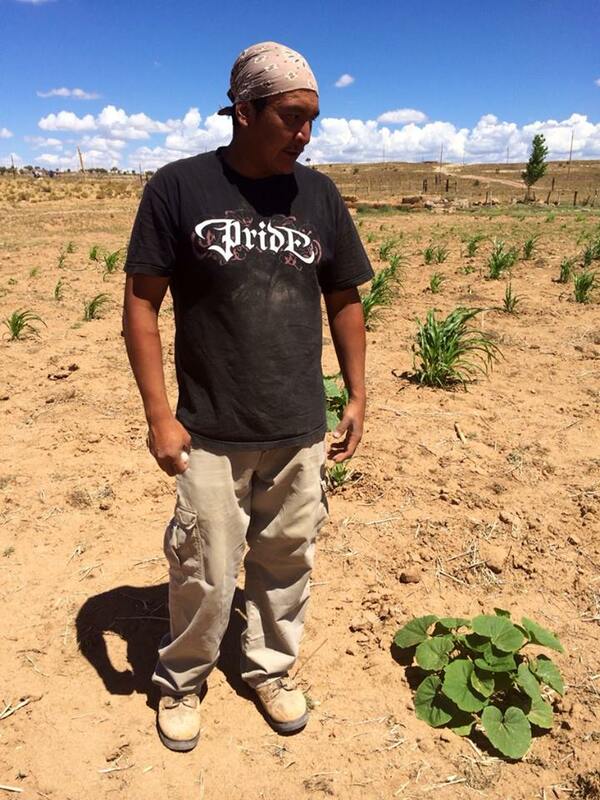 Navajo and Hopi Nations asked Peabody Coal to use a different source of water. Then there was the question of economics. "That is where the just transition started for us. This evolved over the time, with the challenges of bringing in solar panels. There were many challenges, including jurisdiction, community engagement, and the understanding of what the community wants. Roberto said that even with good intentions, if communities don't have ownership of the process, it becomes very difficult. And if the nation is not ready, there are more challenges. Green jobs was the term used in 2008. It was necessary to work with the Legislative Council, and then it was necessary to work with the Executive, during political turnaround. The development they asked for was one that honored the teachings. They advocated for development that includes community, workers and sacred teachings. In Window Rock, the political will wasn't there. Roberto said the big money basically buys out the politicians. "The teachings honor how we live, and how we honor the landscape," Roberto said. This has always been a threat to capitalism. Roberto spoke on the struggle to come out of colonization and how to restore the things that have been taken away through this system. "That is the journey we are on today in the community." Roberto spoke on the original lifeways, and how to honor and support these today. One way is to have a wool buyer to come to the community. "The idea behind the wool project is to get a fair value for our wool," said Roberto, explaining that the middle men have been taking a cut, and reducing the payment to Navajo wool producers. After they began working with a wool buyer and co-op, the payments to Navajo wool producers increased from five or ten cents a pound, to about 60 cents a pound. Along with this, they are having young people come onboard as interns in the Just Transition. Roberto said Dine' society is a matriarchal society, and decisions rest with the Clan Mothers. The Clan Mothers remember when there was a time when the grasses came up to the horses' bellies. This was when the stewardship of land and animals was under the domain of our clan mothers, he said. This changed in the 1930s when the United States imposed its grazing laws. Settlers wanted to dismantle the traditional food system and impose their system. This system of BIA mismanagement meant relying on the federal government in regards to resources. Roberto said today this is part of their work, to restore the cultural teachings in communities. They turned to the Blue Corn Community Development model by Herbert Benally who came up with this model. "It was demonized," by the BIA. Bilagaanas believed Dine' knowledge was primitive, that is part now of the undoing. Herbert Benally wrote about the four pillars of knowledge. Roberto said in the evenings it is important to come back together as social beings, for social wellness. Dine' Ancestors realized that the night time was an important time to invoke the healing of our bodies. Today the goal is ecological wellness. "The insanity of western civilization thinks our resources are infinite," Roberto said. Important life forces are essential. Today, young people are coming from a place of power and need to come into a new mindset. "We are Sacred Beings, we come from an intention of Power." White corn symbolizes peace and is offered before the sun comes up in the morning. 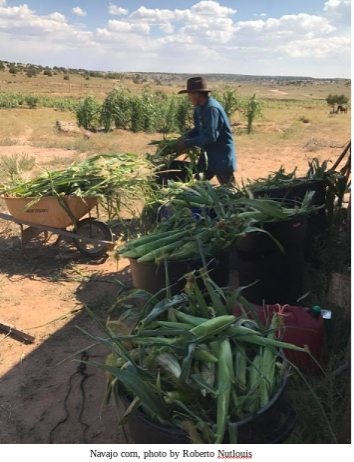 Blue corn gives a lot of strength, for work on the land, and it has a lot of antioxidants. The juniper ash is used in the blue corn meal. Biodiversity means that we are still introduced to healthy foods, including hemp. Roberto's talk was among those at Dine' Citizens Against Ruining our Environment's Western Peoples Convention, June 1 -- 3, 2018. Dine' CARE celebrated its 30 year anniversary. Article copyright Brenda Norrell. May not be republished without permission, or used in any revenue producing projects.